To capitalise on the previously discussed questionable design choices made in 'Audacity' (see my previous article, 'Plug-in chains take Audacity'), let's delve a bit deeper into the world of dubious interfaces in general and try to learn something useful from finding out what's actually wrong with them. And, following up on the topic of 'Audacity', we'll turn to audio editors for real-life examples. 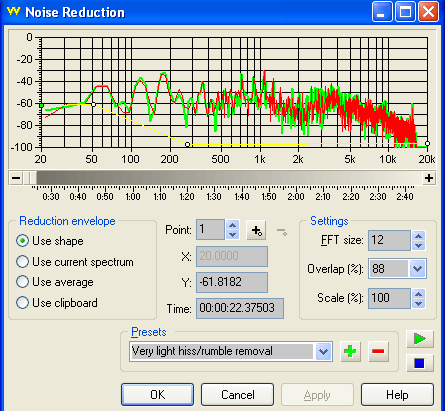 If you've ever tried typing in a search query like 'audio editor' in any search engine, you may have noticed the astounding plethora of oddly similar inexpensive all-in-one tools that pop up among the big-league search results - all as one boasting unprecedented ease of use and requiring no technical knowledge whatsoever. There's actually a certain pattern to these everyman's audio editors - one that makes you really wonder if there could be a certain 'audio editor builder' somewhere, constantly handed over from one evil Internet mastermind to another whenever one feels like making a quick quid or two; and what that said builder actually does is just randomly scatter the generic audio editing tools around the main waveform window, staple on a 'logo' with an even more generic name to it (something along the lines of 'XYZ Audio Editor' - and I'm genuinely surprised to find that this very title hasn't been used for an actual product yet), and suggest a 'reasonable' price for the resulting abomination. You may have noticed the abundance of inverted commas in my theoretised description - yes, there is a reason behind it. So we've downloaded two randomly chosen audio editors: 'Free Audio Editor' and 'Smart Audio Editor' (the latter being about thirty dollars more expensive than the former, but not, for some reason, any more extensive). What we'd normally want to do after we've toyed with the plenitude of effects and buttons on offer, is try to actually improve the sound of that one recording we've intended to process. So we reach for that 'Noise Reduction' effect hoping to wipe out the annoying fan noise in the background and we realise that it's not what the feature is for. 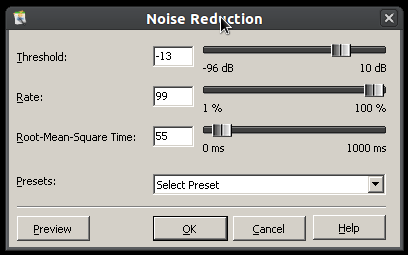 As opposed to those noise reduction modules that actually work (and, admittedly, usually cost about fifty dollars, which is certainly a downside), noise reduction in both our programs isn't concerned with capturing noise prints, profiling noise shapes, and silencing the respective areas of the spectrum to remove the noise from the entire sound file. 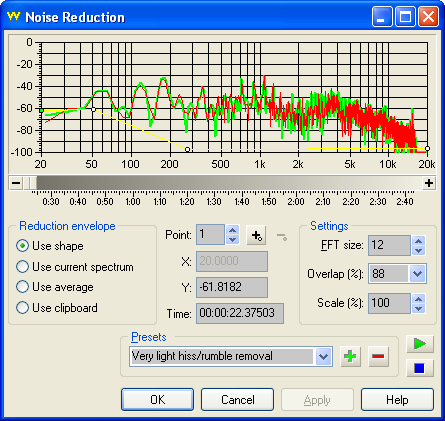 What you do get to do here, is specify the volume level below which the sound input is regarded as noise. So, basically, the sound is either completely muted or left unaffected at all; which does help you get perfect silence when nothing else is playing, but as soon as your recording kicks in, you get to enjoy the complete audio spectrum, fan noises, hissing, and crackle included. One of these costs money. Having compared the screenshots, can you guess which one? Remember those old cassette tapes? Remember how they sounded all chipmunky when you fast-forwarded them without depressing the 'Play' button? This happens because the perceived pitch of the sound depends on its frequency. Which, in turn, depends on the number of vibrations (or waves) the sound makes per second. What it means, is that if you slow down the sound, it creates the same number of waves over a longer period of time, which makes the sound audibly lower. Sometimes, you need to do just that: make the sound play slower or faster and hear the natural changes in pitch that occur in it as a result. Our two downloaded audio editors, however, seem to know better: they only allow us either to change the pitch preserving the length of the recording, or change the speed of the recording preserving its pitch. 'But doesn't it make them more useful?' I hear you ask. Let me explain. You see, I referred to the changes in pitch that occur along with changes in speed as natural because they don't imply any actual sound processing. Preserving one of these qualities of a recording, on the other hand, implies using certain artificial techniques, which inevitably changes the original material (rendering it practically unrecoverable). What it means, is that if you are intending to slow a sound file down in a natural way - with lowering its pitch and so on - you have to subject it to double processing: first changing its speed and then adjusting the pitch accordingly. Which, I'm sure you will agree, isn't quite natural any more. That's about it for today. We'll return to our two guinea pigs of audio editing next time to discuss normalisation scales and oddities of crossfading. Watch this space.